Advertising information page for placing an advertisement with Wassup! There are two means of advertising on our site. The first, claiming or adding a listing, will provide you with a business page in which you can list (or verify) contact information, hours of operation, add photos, etc. Your business will be searchable in the directory with results appearing on the map. Adding or claiming a listing is free. From there, you can upgrade to either “Enhanced” or “Featured.” We’ll explain the differences in a moment. The second means of advertising is placing an advertisement on any of the main pages. If this is what you’re looking for, please CLICK HERE TO JUMP TO CONTENT FURTHER BELOW. To claim an existing listing, whether it’s a place (e.g. restaurant) or event (e.g. concert), you will need to do so via the “claim” button from its page. You will then be directed to fill a short form providing your name, association with the business (e.g. owner, business associate, manager) and contact information. Once your free listing is verified, you will have the opportunity to edit any information. If you’re adding a listing, you will need to fill out each of areas including your business address and/or set it on the map (please select the default map setting.) 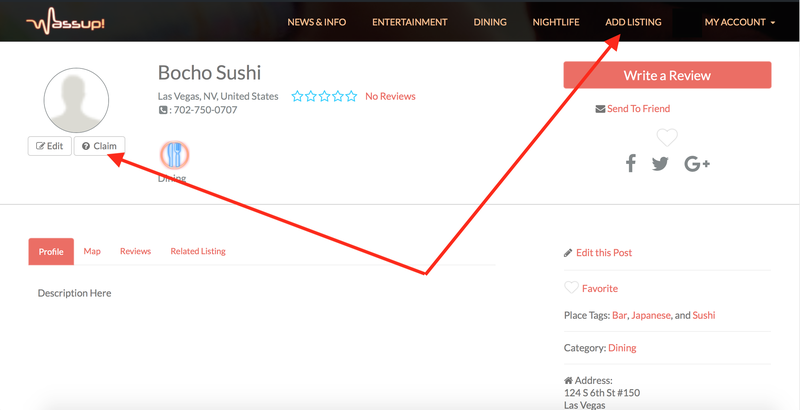 It’s even simpler to add a listing if you already have a Facebook or Yelp page for your business as you can simply import your information and photos (just be sure to verify all applicable fields are completed and your information is correct.) Your neighborhood will automatically fill in as the information is pulled both from our database and Google Maps. There are many neighborhoods and unincorporated areas in Las Vegas and the city itself does not include The Strip. For the sake of clarity, please override the city-setting to either Las Vegas, North Las Vegas, Henderson, or Nellis Air Force Base if necessary and whichever neighborhood you feel best suited for. This will impact people’s queries depending on their search criteria, so choose carefully. Please see more information about neighborhoods here. At the bottom of the form, you will be able to drag and drop photos, upload menus, etc. These will show as “Tabs” on your profile only if you populate them. Once you are satisfied with your information, please accept our terms and conditions and click the red box titled “Review Your Listing” at the bottom of the form. You will then have the ability to review and update your listing as necessary. Once this step is completed, you may upgrade your listing if you wish via the right side-bar as shown below if you so desire. There are two choices to select from: enhanced and featured. Enhanced will enable you to add up to three photos onto your page and limits the number of categories you can show to two (e.g. if you are an establishment that serves food, operates a bar and has live performances, you can select two of the three.) You will be limited to 400 characters for your profile description and users will have the ability to share your listing with friends. If your campaign is not renewed, it will simply downgrade to the standard free listing. Upgrading further to Featured will provide several more advantages. Included in this package, you will have access to Google Analytics reports right on your dashboard which will enable you to see the number of active users currently viewing your page; statistics comparing the current week vs. the previous week; statistics for this year vs. last year; and what country your visitors are seeing you from. Upgrading to Featured will also give you the ability to upload unlimited amount of photos as well providing you with an unlimited amount of space for your profile description; add franchises; remove “Related Listings” from your page that give users suggestions of similar offerings; add videos and special offers; and appear at the top of related searches with a “Featured” branding. Last, but not least, from time to time we will add “featured” listings only onto the appropriate main page feeds which may coincide and/or rotate with “Best of Wassup!” which will be based on user reviews. Have Events, too? We’ve got you covered! All listings are free and anyone can post anything (subject to approval) which will be searchable and visible on both calendars and maps with a default calendar/watch icon. Just as with places, you can upgrade these to Featured listings for a nominal price. If a category doesn’t exist that you think should, please ask! We’ll be happy to add it! Advertising on the main pages couldn’t be any easier. Currently, there are over 60 locations with pre-defined sizes to choose from. Selecting which page and ad slot you want to show your advertisement from via the menu will give you an example of what your advertisement’s size and aesthetics will look like to the right as shown below. Your advertisement will rotate with other advertisement campaigns running in the same space. We are keeping the number of spots limited in an effort to keep pricing down while maximizing impressions for each ad. Currently, we are accepting advertisement placements via cost-per-day only though this may be subject to change in the future. Selecting this will show the rates and any applicable discounts for purchasing multiple campaigns (up to an additional two.) All campaigns are per week. If you wish to run longer than three weeks, please contact us at support@wassupinlasvegas.com. the date you wish to begin showing your ad(s). Payment is accepted via PayPal and you will be directed to their secure website for processing. Pricing for each page and spot may adjust accordingly based on monthly metrics. If you’re really looking for attention, we also have the ability to place ads in the featured image spot (header) and page break of each main page, with certain restrictions: advertisements must be relevant to each page’s purpose (e.g. restaurant advertisements on the dining page; club or bar promotions on the nightlife page, etc.). For quality purposes, advertisements for these locations need to be large files (preferably 1100+ x 400+). The search function cannot be removed from the mid-page sections and will show in the lowest portion. Individual statistics for views/impressions will not be available nor will linking to your website. We can provide page views upon request. This is a great way to stand out on the page! Please contact support@wassupinlasvegas.com for rates. QUESTIONS? Please contact us at support@wassupinlasvegas.com!